iClone - How to equip a wagon to a horse? 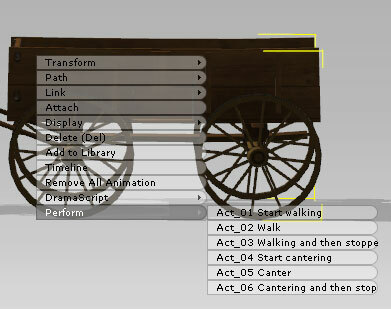 3.Right click on the wagon and the wagon's motion list will appear. You can use the motion after you select it. • To achieve the best visual effect of wheel rolling, we recommend that you change the Frame Rate to 24 when exporting the video.